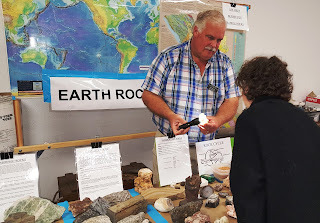 While all geodes contain vugs, not all vugs are geodes. 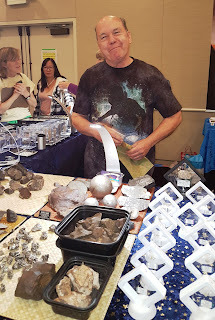 I've discovered that there can be a lot of confusion about the differences between geodes and vugs. According to Mindat.org, a vug is a cavity in a rock, usually lined with crystals of a different material composition than the enclosing rock. Geodes, on the other hand, can form in any cavity, but the term is usually reserved for more or less rounded formations in igneous and sedimentary rocks, while the more general term “vug” is applied to cavities in fissures and veins. This is my very favorite vug. It's only about two inches at it's longest point and the cavity is a bit over one inch deep,but it's full of character. When I hold it in hand, it mostly looks brown, but you get it near lights and it turns into a star. I think the green is olivine and the orange spears are wolfenite. HOW DO YOU IDENTIFY A VUG? 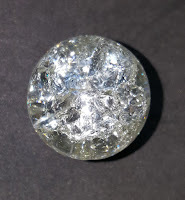 According to Mindat.org, a vug is a cavity in a rock, usually lined with crystals of a different mineral composition than the enclosing rock.This fanciful vug is lined with crystals that appear to be quartz. But as someone who is always trying to listen to the rocks,all I see is an angry swirl with some crystal linings. Not a happy vug at all. Sometimes vugs aren't crystal-lined, but do contain crystals. 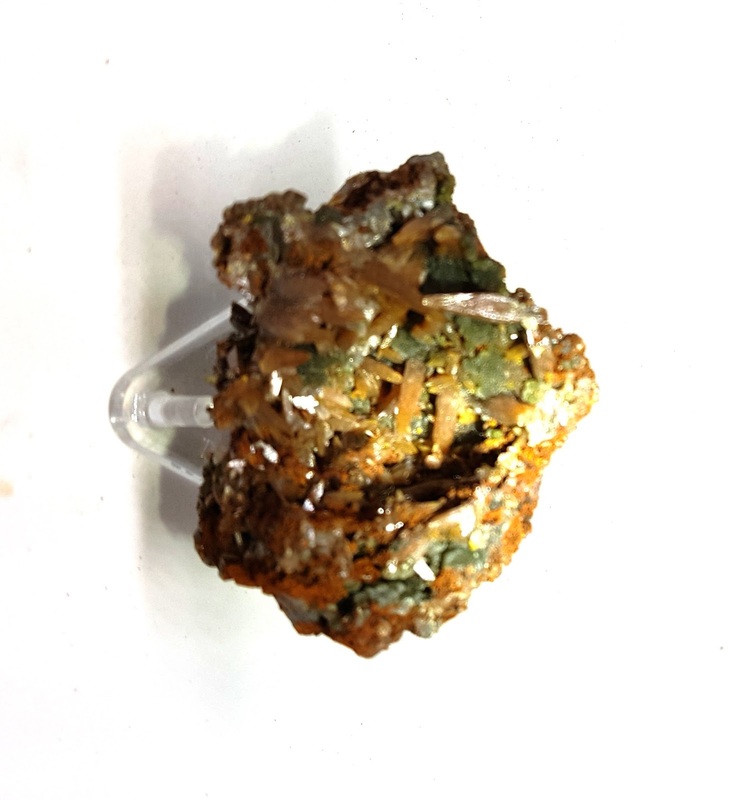 Here you can see two red-brown garnet crystals and the outer edges of the original vug where they were formed. The garnets are a beautiful color, but both have flaws in their formation. They do make a wonderful display piece though! 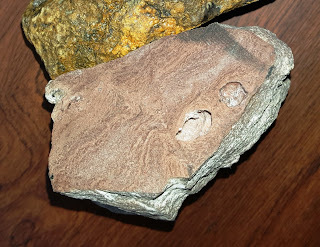 The shot below shows another face of the same rock with empty vugs shown. When I cut this, I REALLY hoped I'd find some more garnets, but sometimes a hole is only a hole. I was ready to call the openings in this rock vugs. When I sliced the rock, the spaces were full of loose dirt and were frankly, ugly. After I cleaned it up, photographed it, and enlarged it, I could see that there actually is a lining on the holes in the rocks. However, that crystal lining doesn't make it a geode because there's no encompassing outer layer, so a vug it is. The thing that makes this picture interesting to me is that the vugs are shown here at several levels of development from the dark spaces that are somewhat friable to finished crystal-lined shapes. 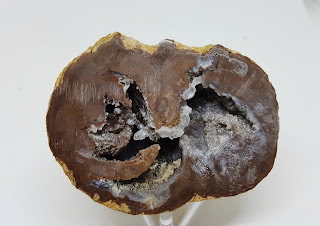 And, here's a slice of a real geode.Notice the strong perimeter banding that makes it obvious that it is separate from the surrounding material. In this case the geode slice shows inclusions at the 4 o'clock and 6 o'clock positions. ROCK & GEM MAGAZINE FEATURE! 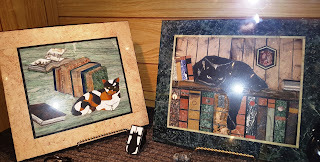 If you are a subscriber to Rock & Gem Magazine, don't miss my article in the January issue about Intarsia/Pietra Dura. It profiles the craft and the history of this artistic craft through the vision and accomplishments of renowned artist Naomi Morgan. Thank you for visiting LapidaryWhisperer.com I hope you enjoy my posts.I'd love to hear from you. I wish all my readers the joy and blessings of the holiday season, however you celebrate it. A rock that insists on telling you a story is a great rock to get to know! Sagenite loves to tell stories. At least the kind I work with in my lapidary shop does. There are apparently two schools of thought when this name is used to describe a rock. There's the one that describes stones with vibrant, puffy strands that appear to be moving with an unseen tide. I absolutely love these. The other is a variety of rutile where the crystals criss-cross in a geometric sort of pattern. The look is so distinctive that back in 1796, it was named sagenite from the Greek and Latin word "sagena" or net. As a professional writer, I'm leery of copying someone's image for my use, like this blog, without permissions. This image appears on a site that says the images are royalty free, but then has a notice to check for copyright. I decided a link was the best way to go. I fell in love with the slab I used to create this cabochon! 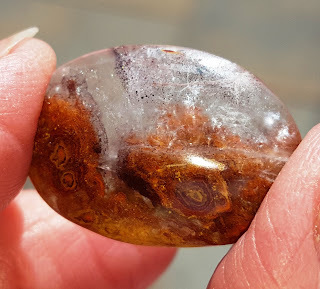 It has the yellowish sagenite, along with white tube structures you can just see inside the clear agate, and a vug that comes across as a whirlpool that is causing the sagenite to swirl around. Pat McMahan, renowned agate expert, wrote that these sagenetic filaments are often arranged in fans or sunbursts in the agates and can come in different colors. 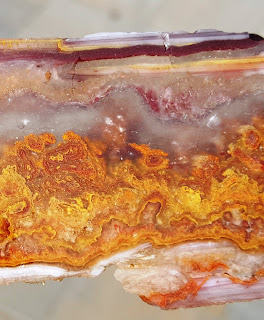 That is because the sagenite in agates is a pseudomorph (where one mineral replaces a different one that has already created the shape). 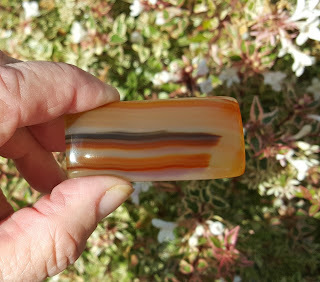 As an interesting aside, he feels that the sagenetic structures form in the still-hardening agate and they don't extend into nearby banded agate which is formed at a different time. This cool piece of sagentic agate really shows off the way the filaments can arrange themselves in groups of fans. The way it has a central open space in the agate with the filaments swishing around it, makes me think of that sight you see when you're in your car as it goes through the automatic car wash. All those soft things rotating and slapping your car as you go through. The vendor who sold me this had a lot of slabs of this material. I asked him what it was and he wrote "sagenite" on the slab I purchased. I've had other people who have seen it agree that it is sagenite, but it's different from my other pieces because there's no cluster that the formations spring from. However, I love the look like it's from a pot of spaghetti and it polishes like a dream! Do you have a favorite agate cabochon that features sagenite? I'd love to see a picture of it! ROCK SHOW SEASON IS ON! If you have a favorite club-based rock show, drop me a note and tell me why it's wonderful and maybe I can use it in a future blog! Until next time, have fun with your rocks! I've always loved dendrites in my rocks. Dendrites are markings in stones that look like ferns or trees or other plants--if you catch them along their long direction. However, when you cross-cut them, you get a bunch of dots like the two different angles of the same piece of dendritic opal below. In today's blog, I'm taking a strict interpretation of dendrites. Some people like to include plume agates with dendritic agates,but aside from the fact that they look very different to me, Roger Pabian, co-author of "Agates: Treasures of the Earth" has clarified the difference in that he states that Dendrites form inside existing agates and Plumes form first and then are surrounded by agate. 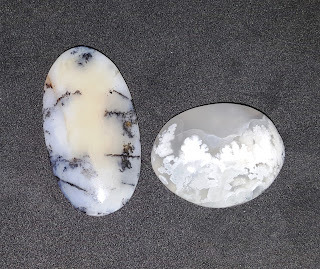 In this picture, the oval on the left is dendritic opal, the oval on the right is plume agate. Notice how the plumes look a bit fluffy? And then there's dendritic sandstone. Sandstone doesn't have a place on the Mohs scale because it can be so soft you can rub it off with your finger up to something very hard that can be used in construction. 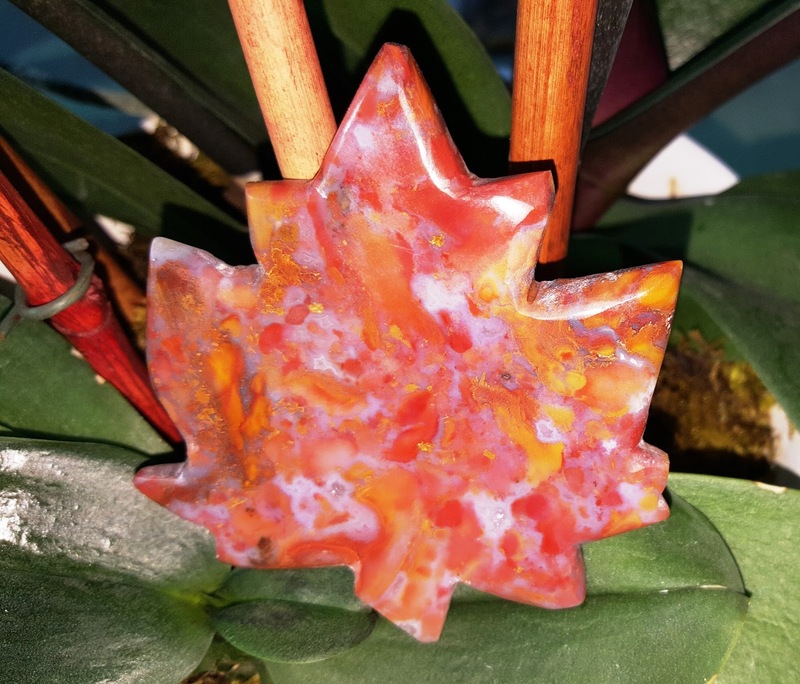 From a mineral standpoint, dendrites consist of iron or manganese from nearby rocks that seep into cracks in the chalcedony and crystallize as they harden, creating the fern or tree patterns that make them so popular. 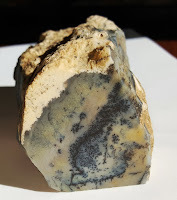 In my readings about them, I was disappointed to see that they were nearly always described as black or brown in color, especially since I have two onyx rocks on my desk right now; one has dark blue dendrites and the other has dendrites the color of burgundy wine. It turns out that manganese oxide comes in a rainbow of colors including pink, violet, green and others. Whenever people try to place walls around the natural processes, there are usually exceptions. 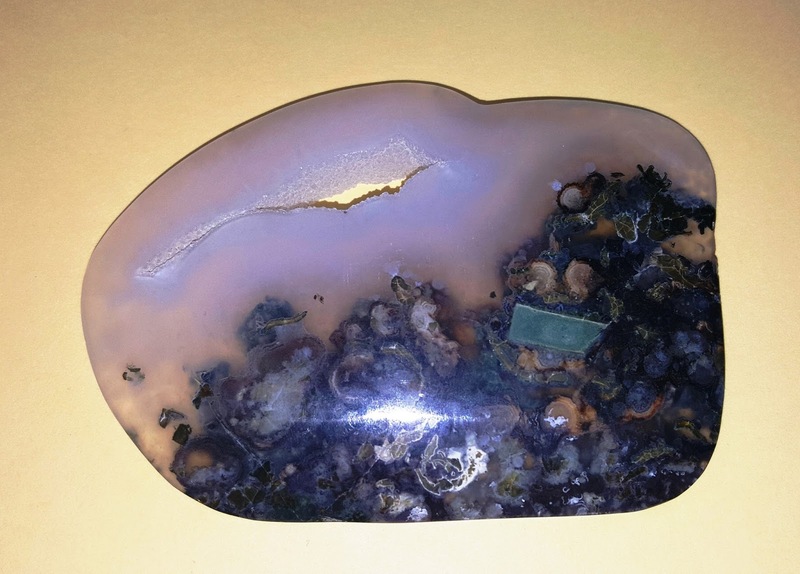 This is a picture of a moss agate. 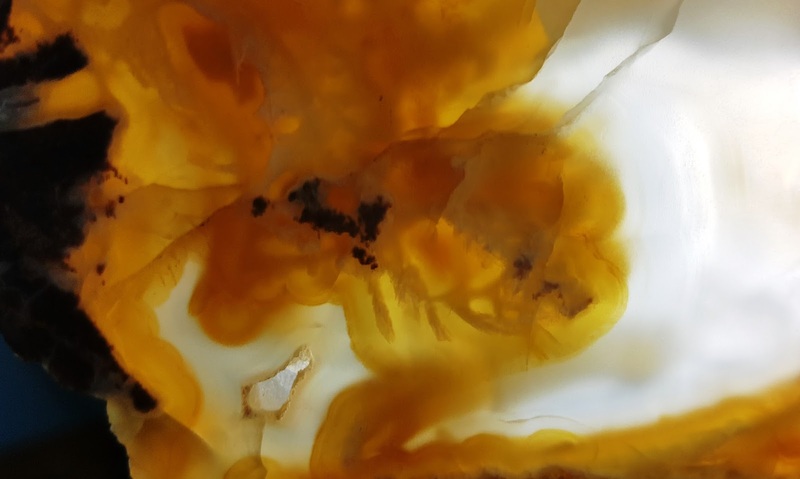 Like other dendrites, it forms in the cracks of established chalcedony rocks. The difference is the mineral inclusion is green hornblende. It's as delightful to work as any of the others, and the startling green color is always an eye-catcher! For all my readers in the USA, have a happy and blessed Thanksgiving. As others begin to prepare for seasonal holidays, I wish you all the best. 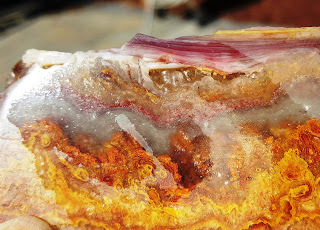 Right now, I'm working on a blog post about how minerals get inside geodes--or when you see a channel between the interior of the geode and it's outside is the material expanding and flowing out, or is it the minerals lining the geode flowing in? Crave-worthy Cabs of the Season! Every season has its colors and shapes. Winter is celebrated in white--even in the places where it never snows. Spring brings pastels along with tulips and daffodils. The color of summer is green; green grass, green leaves, and not to ignore the obvious, zuchinni! Fall, however, brings a riot of color and some great shapes for lapidary! I don't consider myself a good stone carver, but using lapidary saws and grinders, I've managed to make a few fun cabochons to salute the season. This pumpkin cab is about three inches across. When I first saw the slab, I fell in love with the colors that look like textures. It was only about five-eighths of an inch thick, so obviously, I couldn't go for a true rounded top. I did a slow slope up from the edges so there's no noticeable demarcation where the slope stops and the flat area begins. Unfortunately, fall is also hurricane season. This one has been unprecedented in its scope and damage. To me, this cab shows the the vision and emotion of being caught in the fury of one of those storms. The gray rain and objects being thrown through the air tell the story of the incomprehensible damage these storms can create. These colors could absolutely have made a spring garden, but the reds and golds captured my heart as does the last flash of color as the leaves in the trees turn brilliant colors before they die and fall. Crafting this cab was a bit tricky. The first thing I did was find a picture of a leaf, copy it, and print it out on heavy paper in a variety of sizes. I cut several out to use as stencils and ended up choosing one that was just over three inches tall.That meant I would have to do a smooth polished top, similar to the pumpkin, but because of the detail work, I couldn't make the slope as gentle. I actually surprised myself and was able to do this entirely with my trim saw and grinder. I used the trim saw the make the notches, and polished the notches VERY carefully with the edges of my grinder wheels. Finally, here's a small pine cone I made of petrified wood (it seemed appropriate 😉) the uneven but almost parallel lines looked a lot like a pine cone once I scribed the shape from a stencil. The cabochon is sitting on some redwood from my back yard, and it's pretty close in size to the cones the trees drop. The cab is slightly browner in person, but it went red every time I tried to take its picture. Do beautiful cabs blush??? DO YOUR CABOCHON STONES CONTAIN METAL? 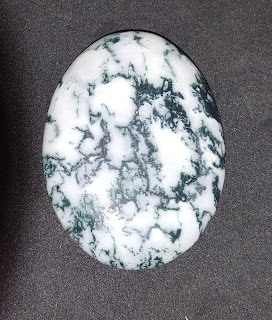 You know how you sometimes see a stone or cabochon and say it has metal in it? Maybe yes . . . maybe not exactly. Here's the skinny on how to tell the difference. METAL- (Naturally occurring) consists of a single atomic element, like iron, copper, etc. MINERAL - a combination of several elements and is generally crystalline, some of which can be processed into metal. Right now, you're thinking to yourself, "Of course, I always go to to the atomic level of identifying the inclusions in my rocks." Relax. If you identify a streak of hematite as iron, you're right for your lapidary purposes. We're not evaluating the metal/mineral content to ascertain whether it can be profitably mined, we're helping those who love our work understand what they're seeing. 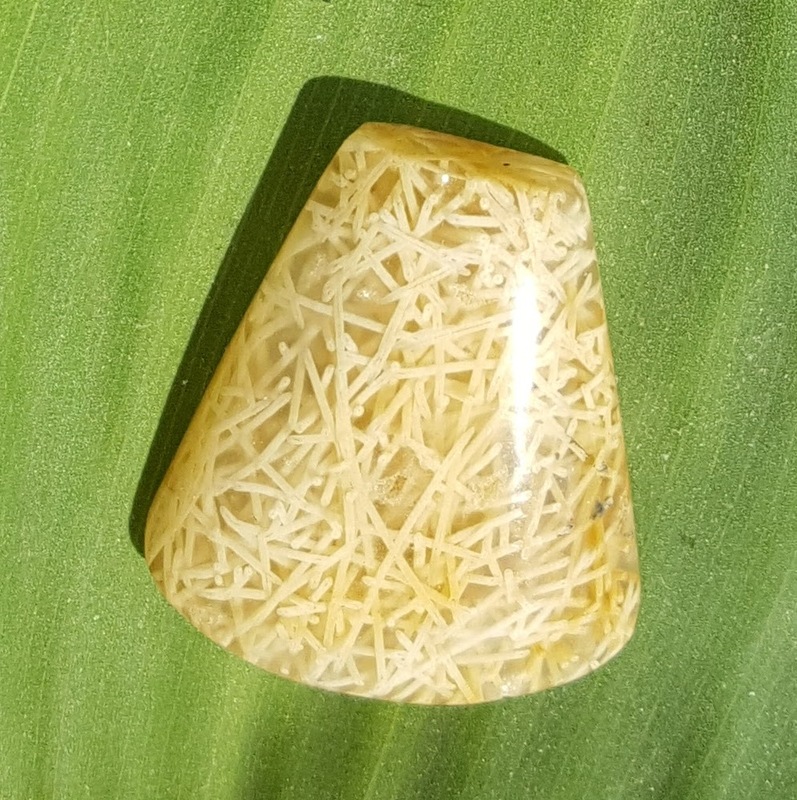 For example, check out this nifty copper cabochon with an epidote matrix (according to the vendor I purchased it from) has the copper peeking through it. However, this Tiger Iron cab? Not exactly. 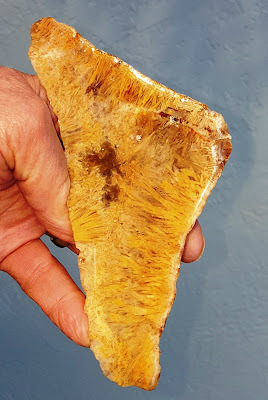 The first time I saw a slab of Tiger Iron, I thought it was a very poor quality of Tiger Eye. But I was wrong. 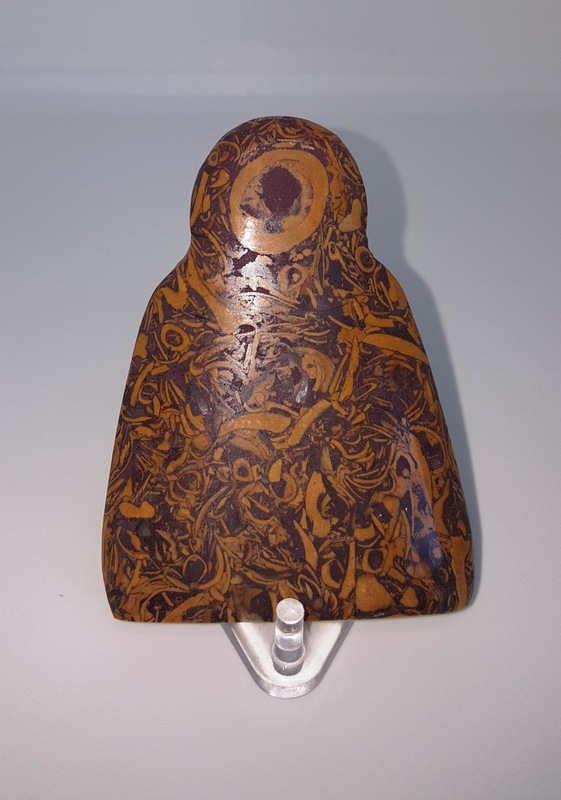 Tiger Iron is a separate kind of mineral that combines Tiger Eye and Hematite in random patterns. Hematite itself, is a form of Iron Oxide which is where the "Iron" in Tiger Iron comes from. Depending on the amount of Hematite vs Tiger Eye, it can be very attractive. However, I prefer a lot more Tiger Eye than Hematite, so this isn't a favorite among my cabochons. The dark overwhelms the chatoyance. I see this from time to time at rock shows, but if I'm doing the buying, I'll get straight Tiger Eye any day. I admit I love this cab! It's quartz with pyrite embedded in it. 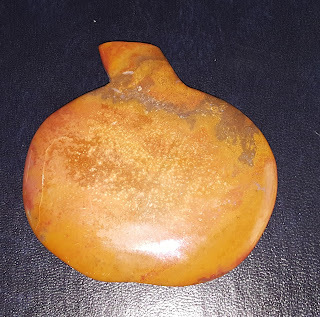 Because of the orange in the quartz and the shapes of the markings, it looks a lot to me like a magical fire. I wasn't able to catch the flash from the pyrite in a picture, but it's very impressive in person. The Pyrite is a mineral (Iron Sulfide) and it's also known as "Fool's Gold". In some settings, like this, it actually looks more like the Iron it contains than gold, but if you've seen pyrite crystals, you understand where the name originated. When I first started admiring Rutilated Quartz, I thought that the different colors of the thin lines meant that they were different materials. Not so. According to Mindat.org, Rutile (TiO2) comes in Blood red, brownish yellow, brown-red, yellow, greyish-black, black, brown, bluish or violet. Oxides are actually found in many stones. 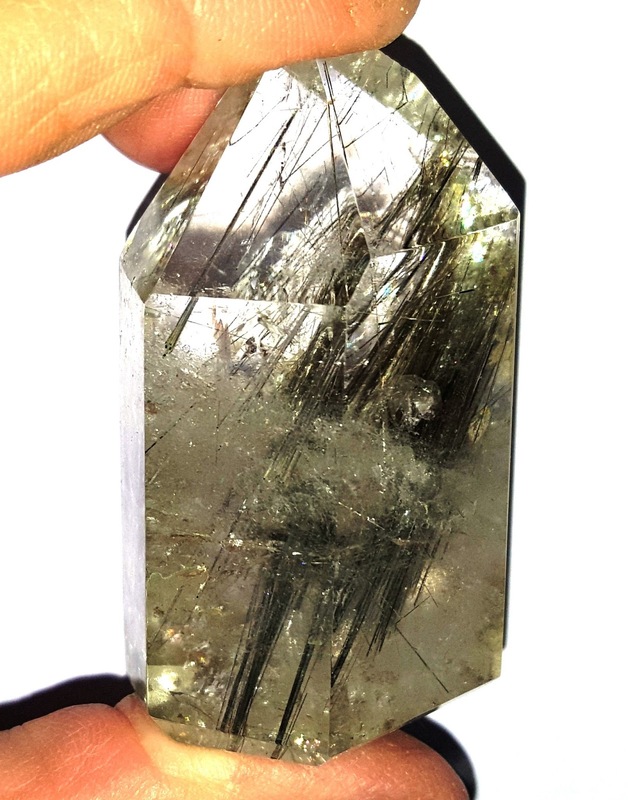 In rutilated quartz, the rutiles can be made of tin oxide. That's the same stuff in the white paste lifeguards at the beach smear on their noses to prevent sunburn. More importantly, in its dry form, it makes a wonderful lapidary polish. 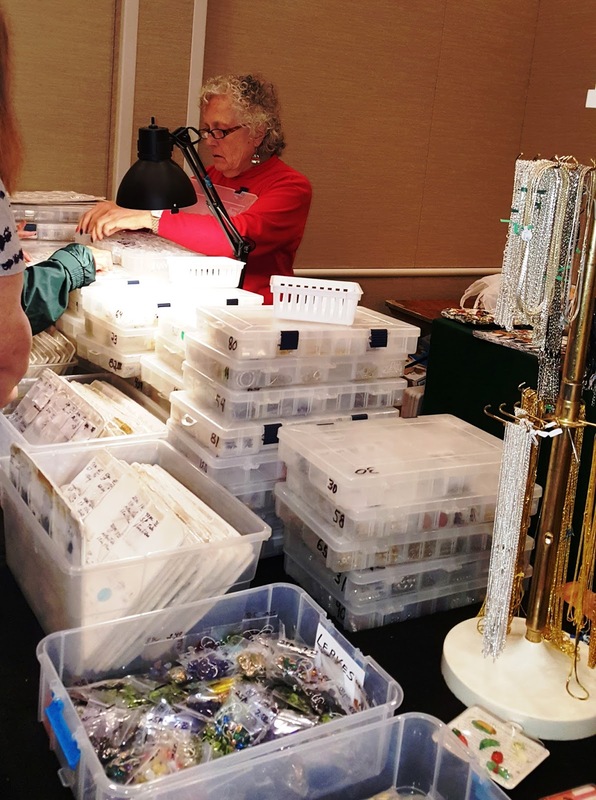 Do you have any inclusions that you want to identify as either metal or mineral? 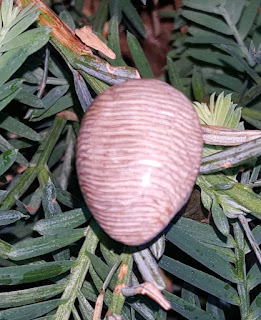 Send me the information and a picture and I'll see what I can do to help you identify it. 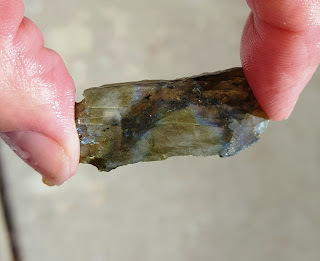 In case you missed it, the cabochon from the last blog post was identified by Burton Rondo as Bacon Opal with Hyalite, so he won! A cab of the material is on its way to him! Notice the silver orbs on the far right and center. It's also easy to see the swoops of black rocks. I've come into some of the most fascinating material, but I can only make a very vague guess of what it is. 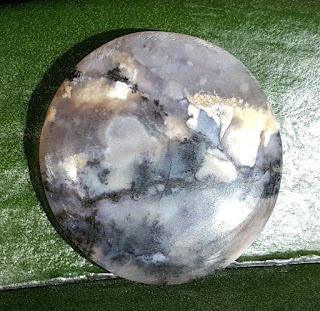 So, I'm offering this cabochon free to the first person (with a U.S. Postal Address) who writes in the Comments section of my blog page www.LapidaryWhisperer.com and tells me where it's from and what the heck is going on in the clear agate. This cab is 25 x 16 x 5 mm and is polished on the back. It was described to me as "old stock" from somewhere in the western U.S. I'm pretty much convinced that old stock means "I inherited it and have no idea where it's from". It's obviously a remarkable gold/brown plume, which seems to me is not only an usual color, but might help place where it was collected. The agate is as clear as glass . . . and then . . . it's full of stuff. 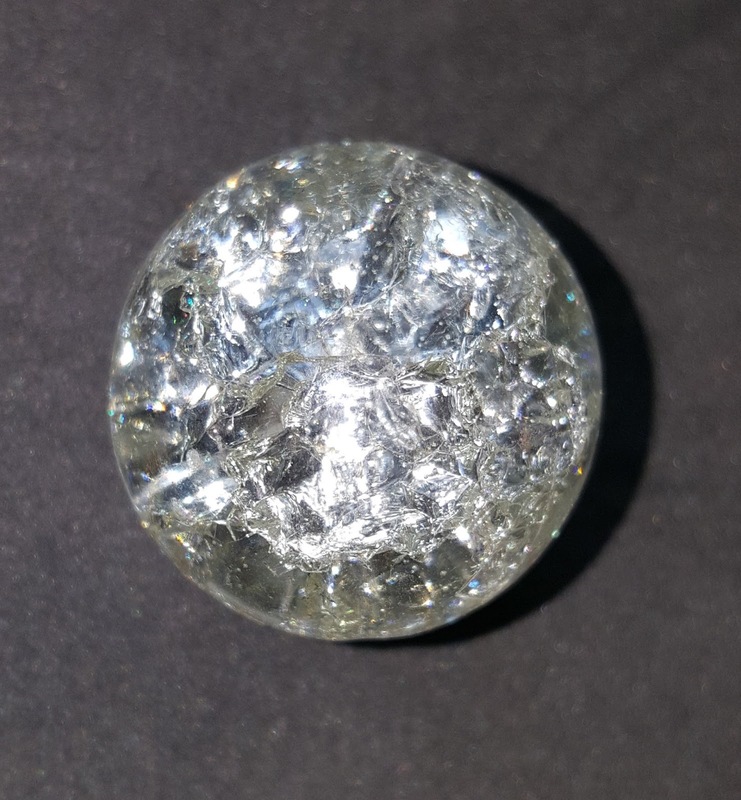 There are what look like silver orbs at various places in the clear agate. So far, so good. But, when I cut and polish it, there's no sign of the orb bits on the edges. What caused them and where do they go when I polish them? With many similar features, you'd expect to at least have a small hollow place where the orb hits the edge. Not here! There are, however, some small voids in the plume parts. 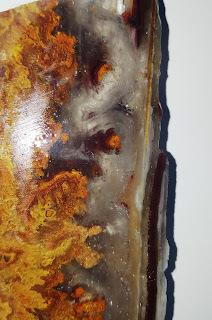 Another hint is that when I look at a slab of the material, there are bumps where the agate has a gap before the top lining. They look a bit botryoidal, but not really, if you know what I mean. They're too separated where botryoidal elements sort of pile on each other like a bunch of grapes. It would appear they have something to do with the bubbles, but there's not clear connection. Notice the clear bumps hiding under the burgundy layer. Then there's the really cool, almost microscopic black bits. They swoop around like bits in a river. They also cover some of the plumes. Notice the cut edge showing the black stuff around the end of a bit of plume. Why do they cling to the plume material but not the silver orbs? Finally, there are planes on the top half of the clear agate. They remind me of a fried marble (yes, I'm showing my age--and I still have mine!). I really expected that area to crumble off when I shaped and polished it, but it's solid. Again, how and why? I'm very curious about this rock, and I really want to know where it is from and what is going on with the clear agate. I suspect that someone who sees this will show it to a collector friend and ask, "Don't you have a garage full of this stuff?" I hope so. This is one time that my love of making up stories to go with stones doesn't work. I'm hoping for facts. So if you've ever seen this stuff, let me know. If you're the first one to get the facts to me, I'll send you the cab at the top of the blog post as a thank you! As a lapidarian, my favorite chatoyant stones to work with are pietersite and tiger eye. They both provide a lot of flash, especially in cabochon form and they're not as picky about angles as I've found laboradite to be. They also both take a nice polish which adds to the flash of the chatoyance. One of the reasons I love working with pietersite is the way the waves of parallel fibers fold back and forth over themselves, creating unique patterns like on this blue specimen. The material is pricey, but I love to treat myself to a piece now and then. Wouldn't you? A BEAUTIFUL WORD FROM THE FRENCH! This beautiful reddish tiger eye is nothing to look at in normal light, but put it in the sun and you get flashes of light called chatoyance. 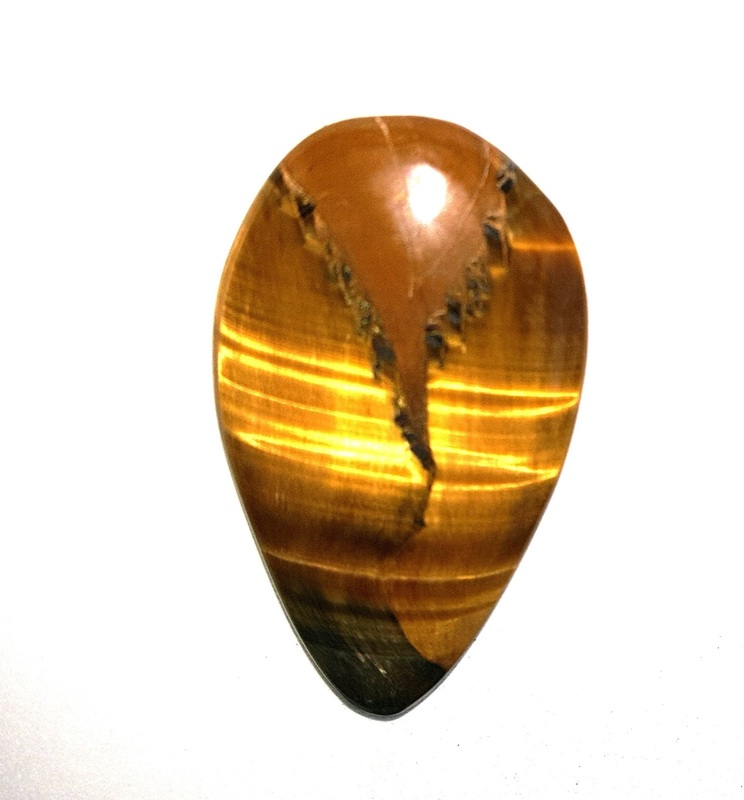 Tiger Eye is one of many stones that share this characteristic. Chatoyance occurs when fibers in a stone line up parallel to each other, at least in a segment. The shine/flash is always perpendicular to the fibers. 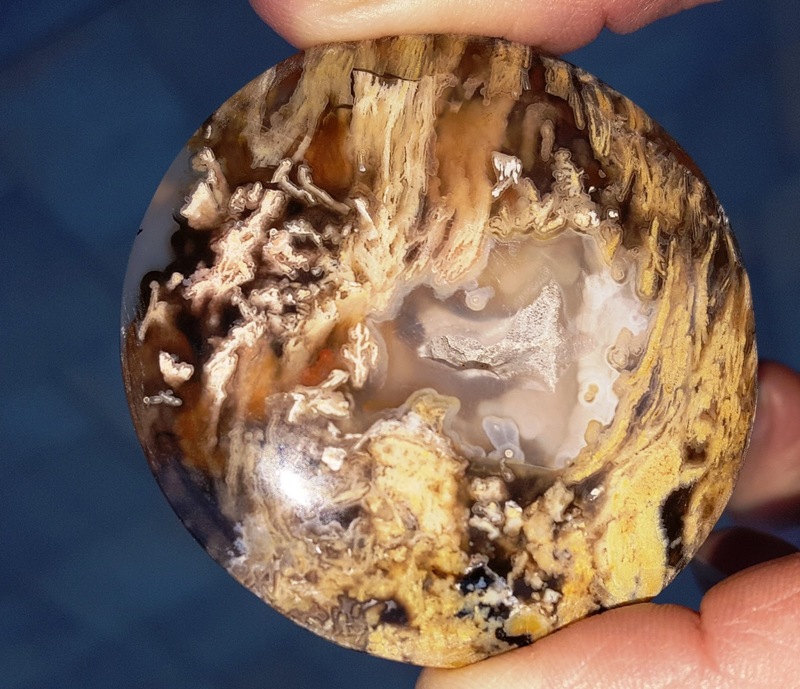 This tiger eye that was in a different blog posting. I love the way it demonstrates how bright the flashes can be. 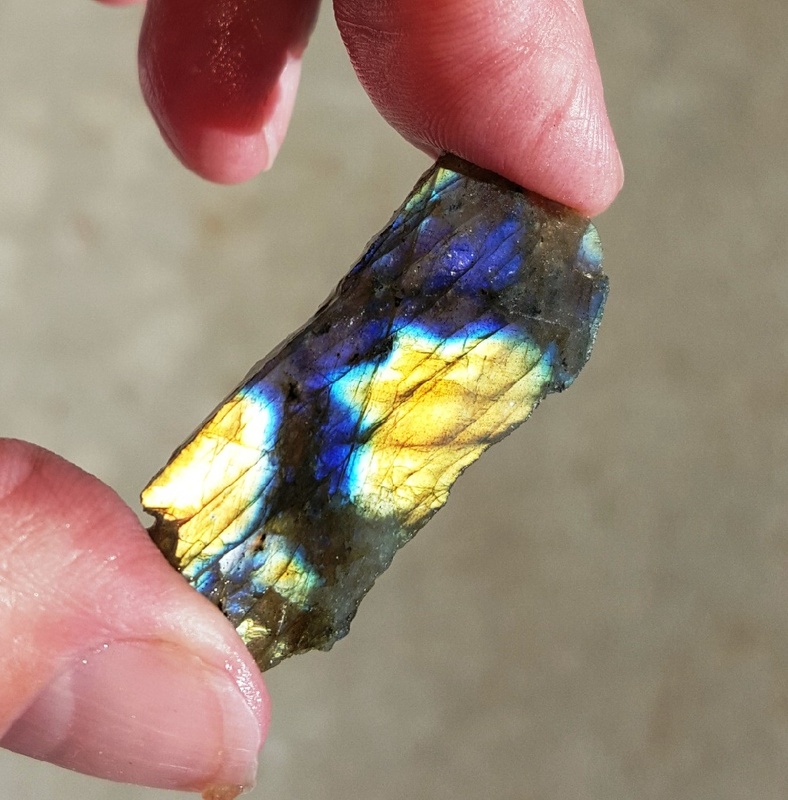 This not very attractive stone is a slab of labradorite I photographed in indirect light. You can see there are some different colors, but it's not anything to get excited about. 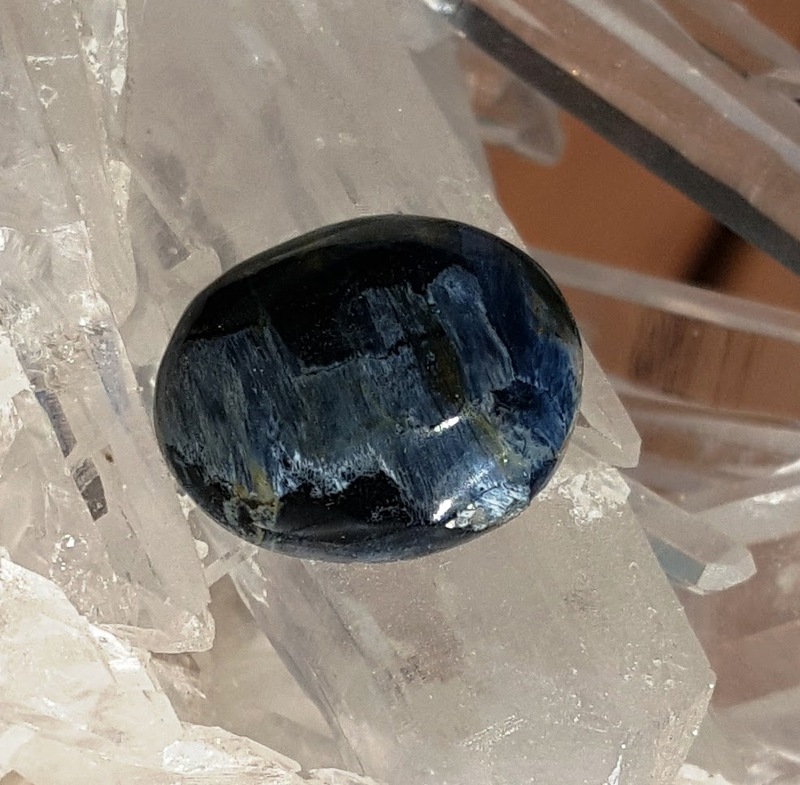 However, you can see the same stone below photographed in sunlight, and the chatoyance creates flashes of dramatic colors. The secret to working with it is to be sure to get that flash on the face of the cabochon. I see it used a lot by wire work artists where the shine of the silver adds to the effect. Charoite is listed as a chatoyant mineral, and I've seen some that is, but this cab of mine really isn't. 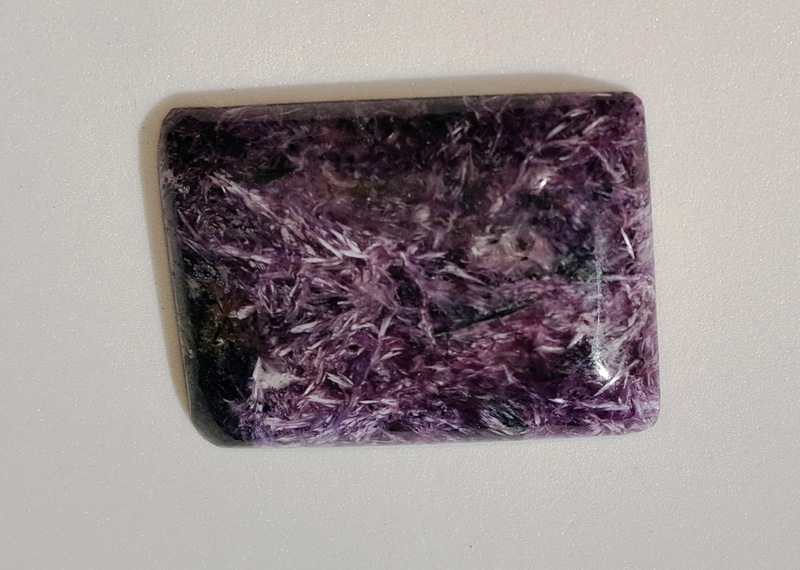 Part of the problem is that not all charoite has bands of parallel fibers. Since the flash happens when the fibers are not parallel to the base and these fibers are completely disorganized, it doesn't flash at all for me. At the same time, it is still a gorgeous purple cab and the white fibers add a lot of interest. Have you ever made cabs with chatoyant minerals? I'd love to see some pictures of you work! 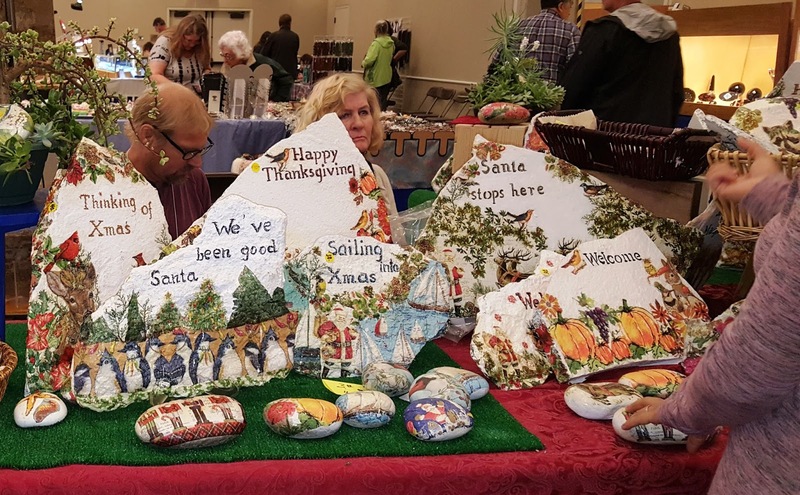 YOU CAN BRING MONTANA BEAUTY HOME! CHECK THIS OUT! I love Montana Agate both for its distinctive style and at about 6.5-7 on the Mohs scale, it's a delight to work and polishes beautifully. 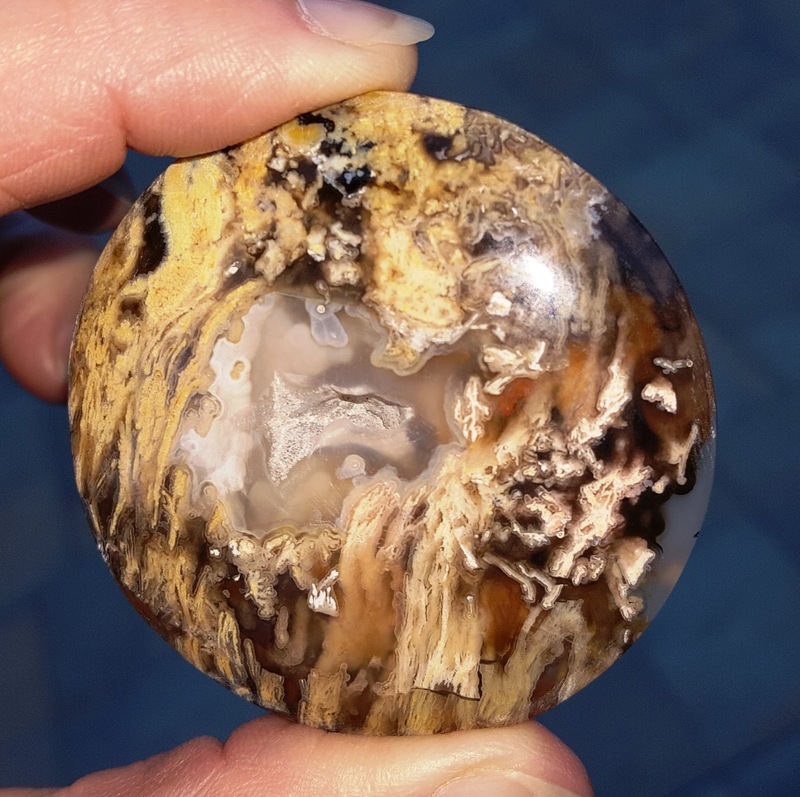 And even though it is very distinctive, there are enough variations in the inclusions to allow the lapidary to come up with countless wonderful stories contained in these stones. This one makes me think of a fast-moving stream going over a gravel bed. The creamy agate is separating the gravel except for one thin area that is fighting the water's power. 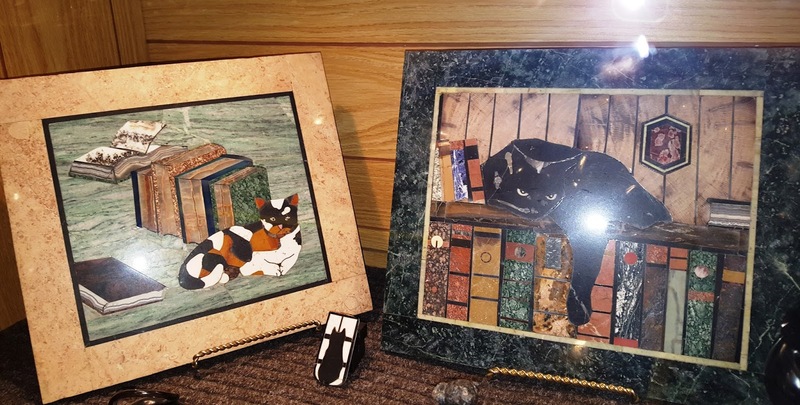 These beautiful stones are found in Montana, specifically the gravel areas between Billings and Sidney. 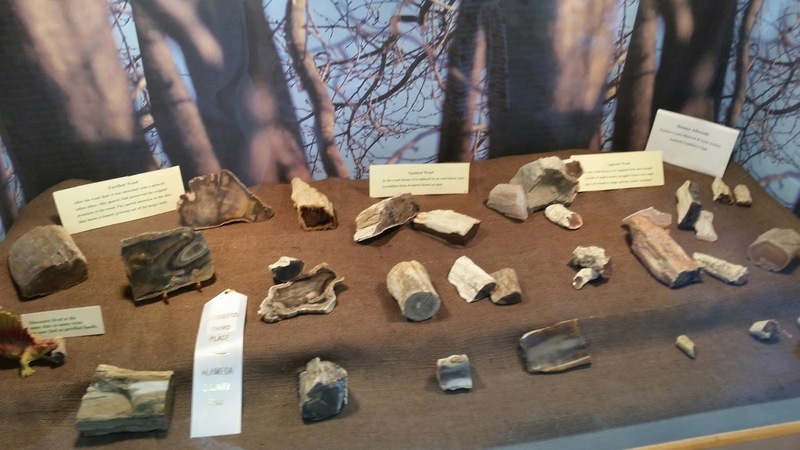 They got there courtesy of the Yellowstone River which transported them from the Yellowstone Park area of Wyoming where they formed in volcanic during the Pleistocene Age which was about 12,000 to 1.8 million years ago. I fell in love with these stones at first glance. I thought maybe there were tiny bits of petroleum trapped when the stone hardened. Sounds good, right? After all, I'd often hear stories in Northern California that stones known as "Apache Tears" held petroleum. They sort of looked like they may have contained some because the color of the stones wasn't even, with some areas more clear and others dark. It was a great story, but it turns out that Apache Tears are obsidian, which often has variations in color. The Tears were a sort of naturally tumbled version. So what was making those dots and lines that set Montana Agate apart? It turns out that the inclusions are primarily made of iron and manganese oxides.The iron oxides give the inclusions a red color and the manganese oxides provide black dots and stripes. They are embedded in quartz that can range from clear to a creamy white. Sometimes people refer to the inclusions as being mossy. They aren't, but seeing this slab makes it easy to see why some would describe it that way. As I mentioned, the stone has a nice 6.5-7 harness, making it hard, but not so hard it takes forever to work. The inclusions also make it fun to try to figure out how the stone wants to be seen. This horizontal stripe piece looks a bit like a long flag to me. The iron and manganese oxide stripes are a bit fuzzy and I think the longish wavy lines add a bit of motion to the image. One thing I really appreciate about Montana Agate is that I've never worked a piece that broke apart, period. Even the thin bands have never given me any trouble. If you're like me, you've had absolutely gorgeous stones you've been working on that suddenly split where there was a color change, but not here! Agate often provides some surprises and Montana Agate is no different. On one slab, I found a druzy-lined vug that was centered between two dark spots. 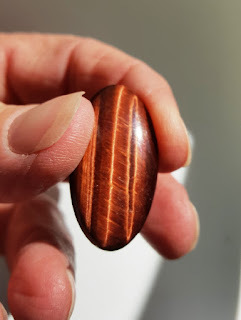 Since I've rarely met a vug I could resist, I decided to create a teardrop shape that emphasized the shape of the vug and allowed me to get a bit of both dark spots on the cabochon. This little cutie was surprisingly difficult to photograph. It faded away to spots on a white background, look blue with another, and dark brown with yet another. 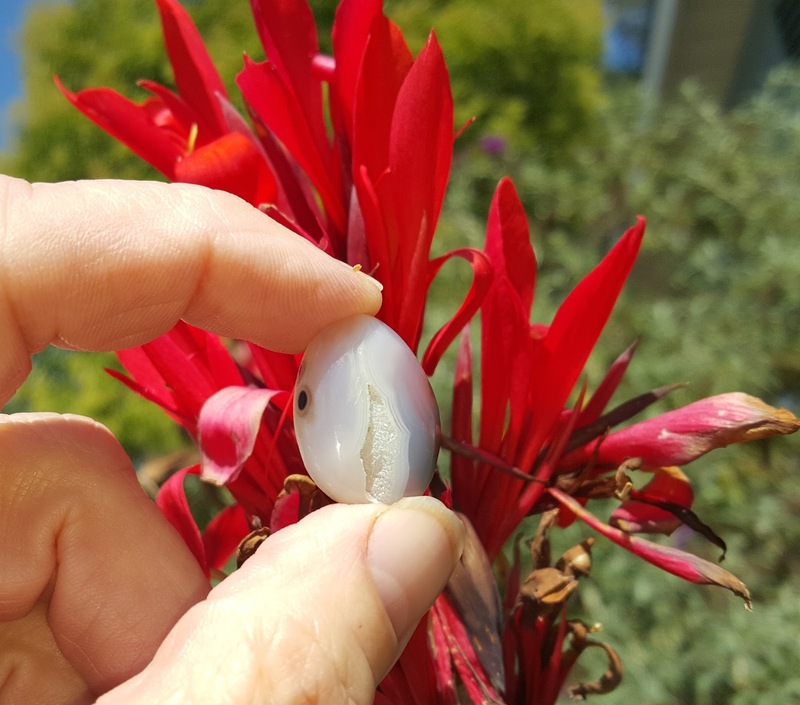 The creamy off-white color of the agate was picking up colors from everywhere. I finally took it outside and held it in front of a red flower, and it bloomed! You can see it picks up a bit of the red, yet most of the pure white remained pure white. I love this picture and I'll probably try this technique again. 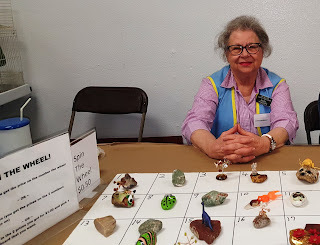 Do you photograph your mineral specimens and cabochons? I'd love to hear how you do it. What are your secrets for a great shot? Maybe I can include them in a future blog. Right now, this mineral is relatively easy to come by, either as a slab or as a finished cabochon. I've always seen some in the rock shows along the West Coast I've made it to, and you can find it for sale online at eBay and other vendors. If you've never had a chance to work it, do get a slab and have some fun. You'll be glad you did! This stone with its hidden face made me think of a burqa, a garment worn in public by some Islamic women for religious modesty. The fact that she is hidden makes me wonder about the woman inside. Is she young or old? Thin or heavy? Is she smiling behind the light fabric covering her face? I think the pattern of brown-on-brown swirls add a bit of mystery to her. As you can see, up around her face there are tiny voids in the st one. I've often found this material to be a bit on the soft side, and here, the inclusions of the swirls which are firmer than the matrix have caused these tiny voids during the grinding and polishing phases. 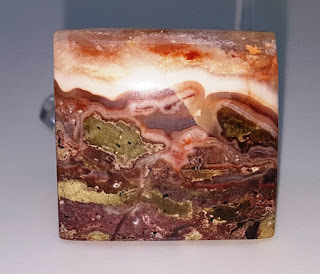 I don't have a name for this jasper. I suspect that it evolved in a marine environment since the mish-mash of curves could be evidence of shells in mud. I purchased this as part of a larger slab. There were several things that caught my eye and I saw an 'under the sea' theme right away--in an environmental way. The darkened area consists of countless bits and having seen images of the amount of trash that has found its way to the bottom of the sea, it struck a chord with me. The rest of the slab is translucent to clear. The color it has is from a yellowish piece of paper I put behind it for the photo to highlight the druzy in the pocket of the wave going over the material. It tells a story and is beautiful to look at. What more could I want? When I look at this cab I made, I think of myself sitting in an airplane and looking out the window. Down below, I see clouds with a break in them that allows me to see the countryside with patches of greenery (farms? forests?) along with some darker areas that may be housing. In the center, there's a smooth blue-gray area that I see as a lake although in reality it's a translucent quartz. This whole mini-world takes place a one inch square cab. Amazing! Picasso marble is loaded with stories! This cab is on the darker side of the Picasso I've worked. However, when I put the stencil over it, it was obviously a bad storm, like the ones you see on tv and in movies just before the ship sinks. I like to think the dark lines across the cabochon are the mast of a venerable sailing ship and the white on the bottom is waves with the white on the top showing the reflection from the lights when I took the photo. Some of the greatest story stones of all are fossils. They are a window into life thousands and thousands of years ago. When I purchased the slab that has this neat bug in it, I was planning to cab it, but then I took a second look in better light. He's about 1.5 inches long. If you're having problems seeing him, the dark debris is where a collar would be and his legs are hanging down in the center of the image. I could probably cab him, but I'm afraid I'd lose parts of him in the process. 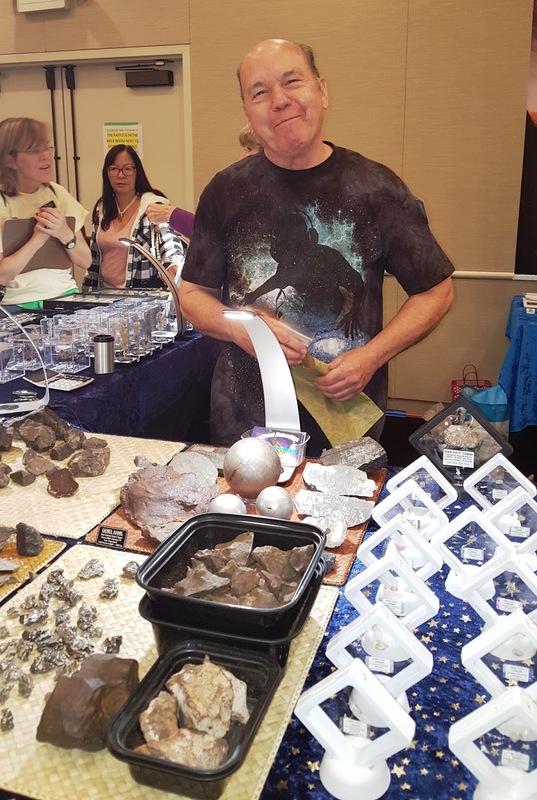 Even non-lapidary people get excited when they see him! That's all of the Story Stones for this time. I hope you enjoyed them. Did you see the Zoo animal rocks last time? I wasn't able to get notices out on social media. Take a look at it while you're here! Drop me a note and let me know what you saw in them. I'll be back in two weeks with another blog.